There were 31 supervisors from 14 Riviera Nayarit hotels who participated from September 27 through November 8, 2017. 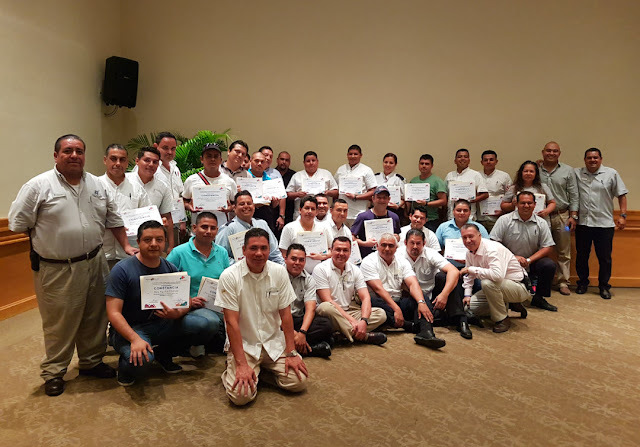 A safety course was held from September 27 through November 8, 2017 with the participation of 31 supervisors from 14 hotels in the destination in order to strengthen and raise the quality of service and tourism culture in the Riviera Nayarit. The course was part of the professionalization efforts undertaken by the Bahia de Banderas Hotel and Motel Association (AHMBB) and the Riviera Nayarit Convention and Visitors Bureau (CVB) with the support of the Government of the State of Nayarit through the Tourism Promotion Trust (Fiprotur). During the brief closing ceremony that took place last Wednesday at the Marival Resort hotel, the instructor awarded certificates to those in charge of the security at area hotels, recognizing their enthusiasm and dedication. Because they are the first point of contact for guests, this helps to raise awareness levels regarding the importance of safety for the attraction and retention of tourism, giving them functional tools to manage and handle any conflict situations they might find themselves a part of. The course covered several different topics, among them, the new Accusatory Penal System; First Aid; An Introduction To Occupational Safety and Health and its guidelines; Earthquakes; Crime Prevention; Business Criminology and Introduction to the Science of Investigation. Participating hotels included: Grand Velas Riviera Nayarit, Marival Resort, Rancho Banderas, Hard Rock Hotel Vallarta, Marival Residences, Royal Decameron Complex, Four Seasons Resort Punta Mita, W Punta de Mita, St. Regis Punta Mita Resort, Villa del Palmar Flamingos, Palladium, Iberostar Playa Mita, Villa La Estancia and Real del Mar.